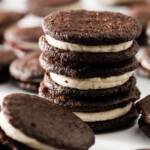 Once you see how easy it is to make homemade Oreos, you may never buy store-bought ones again! They are even better than the real thing! In a medium-sized bowl, whisk together the flour, cocoa powder, baking soda, baking powder, salt, and sugar. Beat in the butter and the egg with an electric mixer on high speed. Continue mixing until dough comes together in a mass. Roll out the dough to 1/8" thickness between two sheets of parchment paper or two silicone mats. Use a cookie cutter or the rim of a glass to cut out dough to 1 1/2 inch circles (or whatever size you desire). Re-roll dough scraps and repeat. Bake on a parchment- or silicone mat-lined cookie sheet for 9 minutes or until set. Place cookies onto a cooling rack to cool. Beat butter on high speed with an electric mixer for about three minutes until light and airy. Add vanilla bean paste and salt and continue to beat for another minute. Place another cookie, equal in size to the first, on top of the frosting. Lightly press to work the filling evenly to the outsides of the cookie. Continue this process until all the cookies have been sandwiched with frosting. Eat the cookies using whatever method you prefer. I like the take apart, lick the cream, then eat the cookie method. Always use dark cocoa powder. Roll the dough between two non-stick surfaces like parchment paper or silicone mats. Experiment with different sizes and shapes. Experiment with different filling flavors. Oreo cookies last up to two weeks in a sealed container on the counter. They can also be frozen and thawed before serving.